A slothful man, I'm always on the lookout for the easy way out. Meine Überfrau says, "You look like you're walking backward even when you're walking forward." Her mother, Iola Schulz, of innocent countenance and mischievous disposition, once said, "Dogs like Dana because his favorite position is prone." She died at 96 when she was ready, the peaceful death of the just. So, as a gardener, I'm alert to things that don't require much effort, like dill, a shirker's dream. Another shirker's dream is snap beans. Once called "stringed beans," some genetic whiz has bred the strings out. 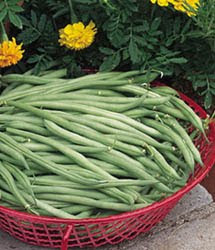 Snap beans or green beans should be harvested while immature. If they are left to mature, the result is a fibrous husk and big, lumpy beans, a tasteless unpleasantness. Best is an edible tender husk and puny immature beans. Part age, I just turned 83, and part sloth, I don't like to bend over. I don't know many people who do. It's an unnatural position because human beings are designed to stand up straight or lie down. My gym teacher, nowadays called a physical therapist, tells me I should squat rather than bend over. Now, squat is an ugly word. My drill sergeant in the army, a disagreeable carrot-top named Statz, was particularly fond of the word, often using it as a command. I once drove 250 miles out of my way to give him a piece of my mind only to find that he'd died of unnatural causes. When I became a drill sergeant, I, also, found the expression useful in humiliating recruits, the first step in learning military discipline. "The squats" aside, picking immature beans is often unpleasant because bush beans grow underneath the leaves, a hangout for bees, grasshoppers, and spiders. 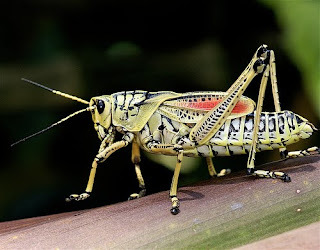 If gardeners like to talk while gardening, agape, a grasshopper just might see an open mouth as a safe haven. Some gardeners wear gloves which are inconvenient. The trick is to find immature beans that grow on top of the leaves. Happily, such a variety exists. "Maxi," a cultivar, can be obtained from www.gourmetseed.com and is a fine green French Filet, thin, straight, and tender which matures in 51 days. Another bush bean which is worth a little back pain is the cultivar "Rocquencourt," another French Filet. 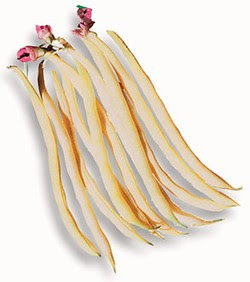 A yellow wax bean of golden color, its full name is "Beurre d' Rocquencourt" (Butter of Rocquencourt.) An heirloom from one of the richest agricultural areas in France, it's probably a descendant of the first beans introduced to France from Algeria in the 1840's. Its flavor is worth the price of standing up a few times to stretch out the kinks, even some extra effort, while keeping the mouth shut. The next bean is "A Cosse Violette Sans Fil" which means a purple husk without string. A beautiful plant with lavender flowers and purpled veined leaves, it is a trophy which produces long, purple beans. A pole bean, it's so attractive that it can be used on a lattice to shield a deck or patio, doing triple duty as shield, trophy, and vegetable. It is best steamed rather than boiled to retain the purple color. 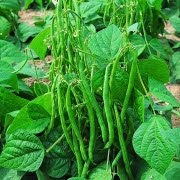 Of course, there are the durable regulars, such as the Kentucky Wonder, also called Old Homestead, and Blue Lake, and, reliable they are, producing delicious snap beans, both bush and pole, all-American regulars. The two mentioned first are fancy French haricots verts. Beans are easy to grow. The only inconvenience of the pole bean is erecting a pole which can be a teepee, a lattice, strings, a wire fence, or what-have-you. The "Cosse Violette" is worth the inconvenience. Snap beans are best planted in a rich, friable soil, laden with compost and manure. They should be planted about 1½ inches deep, 3 to 5 inches apart, and covered with organic material, like straw. Since snap beans produce their own nitrogen, a low nitrogen fertilizer is best, first dug into the soil before the seeds are planted, and then side-dressed every few weeks thereafter. They should be watered to about nine inches in depth, but the ground should never be sopping wet, just moist. Se planter des haricots succulents et savoureux.